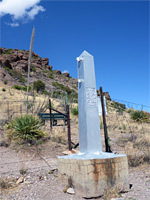 A small area of the Coronado National Forest adjacent to the Mexican border is given over to the Coronado National Memorial, which commemorates the expedition of Francisco Vásquez de Coronado in 1540, the first known excursion of Europeans into the United States. Francisco was a Spanish governor who arrived in Mexico in 1535 and was chosen to lead a large group of settlers charged with exploration of the then unknown territories to the north, suggested by rumors of the time to include major cities decorated with gold and jewels - the 'Seven Cities of Cibola'. Coronado entered what is now Arizona along the San Pedro River valley, a few miles east of the memorial, then continued north along a route marked today as the Coronado Trail, though there is no trace of his passage remaining today. Instead, the site offers several hiking trails through the wooded foothills of the Huachuca Mountains, excellent views over the river valley and south into Mexico, a cave, and an interesting variety of plant and animal life. All could be seen in less than one day and the area is quite isolated and not well known hence does not get many visitors. 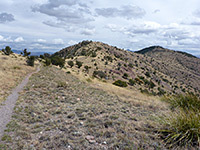 But there are many other hiking possibilities in the national forest to the west and north, and it is close to other historic sites like Tombstone and Bisbee. Coronado National Memorial is reached by driving 40 miles south along AZ 90 then AZ 92, starting from exit 302 of I-10 at Benson, then 5 miles west along Coronado Road (FR 61). It is not well signposted. 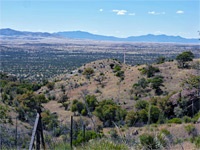 The drive is along the west side of the San Pedro valley, between two rather barren mountain ranges; the immediate surroundings are empty grassland at first but become quite built up around the Fort Huachuca Military Reservation and the dispersed town of Sierra Vista, where much new housing development has taken place. En route, AZ 90 passes the Kartchner Caverns State Park, containing a beautiful cave system whose discovery was only reported as recently as 1978, though tours are rather expensive ($23 per person in 2019), and no photography is permitted. Most unusually for an NPS location, there is no entry fee at Coronado. After the park entrance, the approach road climbs gradually, into oak woodland, and soon passes the visitor center. 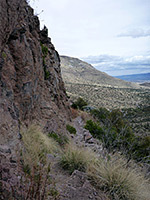 From here, a 0.5 mile path leads up a hillside to Coronado Cave, a small cavern with limestone formations. The memorial road continues through the forest up Montezuma Canyon, becomes quite narrow and twisting, then unpaved at the far end of the valley where it ascends sharply with several tight turns and past precipitous drop offs; no vehicles longer than 24 feet are allowed. The road reaches a fine overlook at the top of a ridge (Montezuma Pass), close to the western edge of the memorial, a point with excellent views down the canyon and west over more desert and mountains towards Nogales, to where the unpaved road leads after another 50 rough miles. A short trail ascends gradually to the top of Coronado Peak (6,864 feet), with even better views, including south to distant mountains in Mexico. There are two main hiking paths in Coronado National Memorial - one is Joe's Canyon Trail, descending 1,350 feet from Montezuma Pass along a ridge then down a side canyon back to the visitor center, initially through bushy grassland then into the oak woodland. This is best hiked downhill as a one-way trip, if a car shuttle is available. The second is the Yaqui Ridge Trail, just over 1 mile long but also quite steep, this drops 500 feet down a ravine, right to the border with Mexico, and international boundary post number 102. The path itself is unremarkable but it is worthwhile to stand at this very remote spot at the edge of the country, or even step over the fence into a different land. The course of the border is visible a long way west, as a barbed wire fence running dead straight over the uninhabited grasslands. This point is also the southern terminus of the Arizona Trail, a cross-state route spanning 790 miles that ends in the north at the Utah border in Coyote Valley, near the Paria River.